Send home a note to remind parents of the program and to encourage the children to bring their Thirteenth Sabbath Offering on June 30. Remind everyone that their mission offerings are gifts to spread God’s Word around the world, and that one-fourth of our Thirteenth Sabbath Offering will go directly to help the three schools in the North American Division. The projects are listed on page 3 and on the back cover. Note: Ask up to eight children to present this program. There are five speaking parts (Narrator, Adrian, Mother, Cousin One, and Cousin Two) and potentially three non-speaking parts (Kobe, pastor, and first-grade cousin). The children don’t have to memorize their parts, but encourage them to read through their part several times so that their presentation is smooth and comfortable. They could act this out with a bed and a table for Bible studies. The table could double as a pulpit for Adrian to give his worship talk. Narrator: This quarter we have met people from Ebeye [pronounced: EE-by] Island; from the Mamawi Atosketan [pronounced: MAMA-way a-TOSS-key-tan] Native School in Alberta, Canada; from West Virginia; and from Holbrook Seventh-day Adventist Indian School in Arizona. 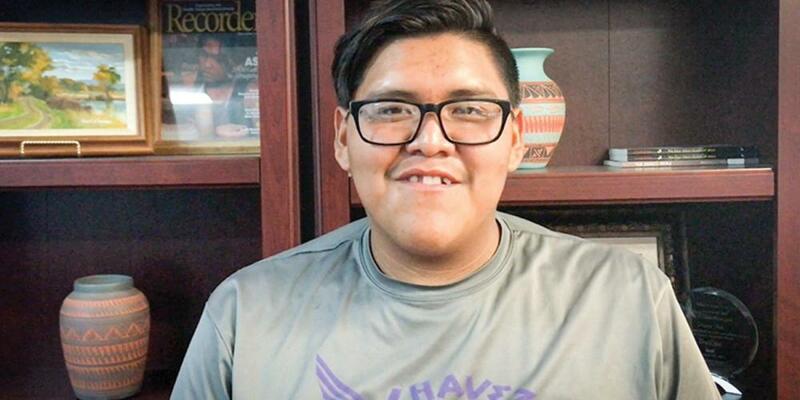 Today we will hear one more story from Holbrook—about a student named Adrian Wiles. Narrator: Adrian was in the third grade when he arrived at Holbrook Seventh-day Adventist Indian School. He didn’t want to live at the boarding school in the U.S. state of Arizona. [Find Holbrook, Arizona, on the map.] But some adults thought it would be good for him to move away from home. Adrian had a hard life at home. He didn’t have a father, and his mother often drank. Sometimes his mother locked him out of the house, and he slept with the family dogs under the front porch. When Adrian was 7, his older brother taught him how to drink alcohol and use drugs. Adrian didn’t think anything was wrong with his life, and he didn’t want to move to the school—even though three cousins already studied there. Mother (sternly): Go back to your room and stop being a big old baby! Narrator: Adrian wailed and refused to let go of her ankle. Finally, his cousins picked him up and carried him back to his room. He cried even more as he looked out the window and saw his mother drive away into the night. His cousins didn’t sympathize with him. He was creating a scene, and they didn’t like that. Cousin Two: Stop being a big baby! Narrator: With no one to comfort him, Adrian looked around his room and noticed for the first time that his new roommate, Kobe, was also crying. Kobe was in the third grade, too, and this was his first night away from home. The two boys cried together as they fell asleep. Adrian cried every night for a month. He missed his family, and everything was new at the school. He couldn’t understand why the teachers and many students were so friendly. Adrian: I had a hard time adjusting to people being friendly to me. I came from a broken-down home where people are kind of mean. Narrator: After a few weeks, the school pastor asked Adrian and Kobe to lead a worship service. Adrian felt a little nervous about standing in front of the other 65 students, but he got up and spoke about his home. Adrian: I never met my father, and my mother and brothers drink a lot. I hardly know the date of my own birthday because my family has never celebrated it with cake and presents. Narrator: When Adrian finished speaking, he felt a lot better about being at the school. Adrian: Talking about this let the other kids know about the atmosphere where I came from and helped me relax. Narrator: Adrian learned many new things at the school. He learned that it’s important to take baths and to wash his clothes. He stopped drinking and using drugs. He found that playing basketball at the gym helped cheer him up when he felt sad. He came back to the school for fourth grade, fifth grade, and sixth grade. In the seventh grade, he studied the Bible with the pastor and decided that he wanted to give his heart to Jesus. Adrian: The pastor told me who God is and taught me how to pray. I wanted to be baptized to make a public statement about my commitment to Jesus. Mother: We are glad that you are changing and you are getting an education. Narrator: Her words made Adrian so happy! His mother had never gone to school after eighth grade. Today, Adrian is in the twelfth grade and is excited that five of his younger cousins are attending the school for the first time this year. He prayed all summer that his cousins—who are in the first through ninth grades—would be able to come, and he said God answered his prayer. His youngest cousin, a first-grade boy, wasn’t happy when he first arrived at the school. That first night in the dormitory, he cried and cried and asked to return home. Adrian did something that nobody did for him on his first night. He went to his little cousin’s room to comfort him. Adrian (speaking to little cousin crying in bed): “Try not to think about it. I was in your spot when I was small. You’ll get used to it. Narrator: Adrian no longer cries about home, but he does think about a new home—the place where he will live with Jesus one day. He can’t wait! [Ask the audience:] What about you? Are you eager to live with Jesus? Part of this quarter’s Thirteenth Sabbath Offering will help Holbrook school build a new gym and cafeteria. Adrian said the new gym is especially needed so more students will be able to cheer themselves up by playing basketball when they feel sad. Adrian: And I feel embarrassed about the condition of the gym when visitors come to the school for community events. I want them to think the best of my new religion. Thank you for your big Thirteenth Sabbath Offering!